Jean-Robert Bellande has often been teased about his weight over the years. So he turned this into motivation to win a big prop bet, which you can read about below along with other highlights of the week’s poker news. Having opened in 1907, the AFC has just a little bit more history than your average Macau or Vegas poker room. Unfortunately, this classic gambling den is in danger of remaining closed after the September 16th raid that saw the top brass arrested for money laundering and employment irregularities. This case is still being sorted out, but in the meantime, no hands are being dealt and 213 former employees are without a job. Thankfully, there are people working behind the scenes to try and save the AFC and keep one of the world’s more-fascinating poker rooms alive. Bruno Fitoussi, Bruno Lopes and Liv Boeree are just some of the players behind the “#BringBackACF” campaign, which is demanding answers from the French government about what will happen to the club. Since no answers have been given yet, the group sent a letter to France’s President of the Republic, Françoise Hollande, urging him to ensure that the AFC is treated fairly in this matter. Published by PokerNews, the letter claims that the AFC is under “unfair persecution” and its closure would mean dozens of illegal poker clubs opening up throughout Paris. The latter may appeal to President Hollande since the government would rather keep tax dollars rolling in, rather than spending money to shut down illegal clubs. Phil Ivey has been a very busy man in recent times. He opened a poker training site called IveyLeague, lost a $12.1 million lawsuit to Crockfords, formed an entertainment/promotional company called All In Entertainment and won his 10th WSOP gold bracelet this past summer. So what’s next for the poker pro who knows no bounds? According to the Las Vegas Review-Journal, marijuana is on his mind. He was one of 26 applicants who were approved by the Las Vegas City Council for a medical marijuana dispensary. This is good news for the poker pro, however, he still has a number of obstacles standing in his way. He needs approval from the Nevada State Health Department along with passing a final hearing from the City Council. Furthermore, most of the 26 applicants won’t be able to open a pot shop since the state approved Vegas for less than half this number. Still, Ivey is in the running and has a number of business credentials along with the necessary funding. So it’ll be interesting to see if the 10-time WSOP champion can soon expand to selling weed. Jean-Robert Bellande has become the poster boy for self-effacing humor, making fun of himself for constantly being broke and overweight. But the Survivor contestant-turned poker pro will have a few less jokes to make about his own weight. In a prop bet that’s spanned five months, JRB needed to drop from 287 pounds down to 245 to win $70,000. This is no easy task for a guy who regularly tweets pictures of himself at Vegas parties every week. And it came right down to the end as Bellande needed to lose several more pounds with just days left. Having $70k out in front of him served as great motivation to lose the extra weight and hit his goal. 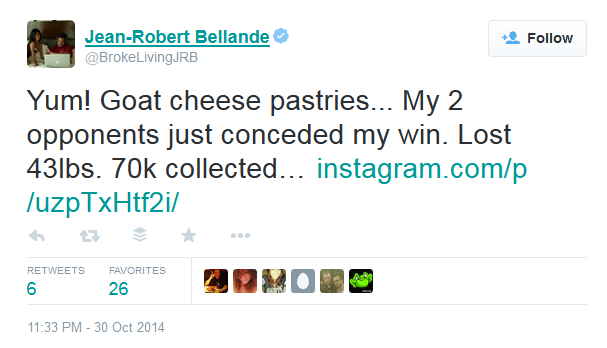 All told, Bellande lost 43 pounds and treated himself to goat cheese pastries in the aftermath of the prop bet victory. With another $70k, he should be able to buy quite a few more goat cheese pastries in the near future.